Let your money work as hard as you do! 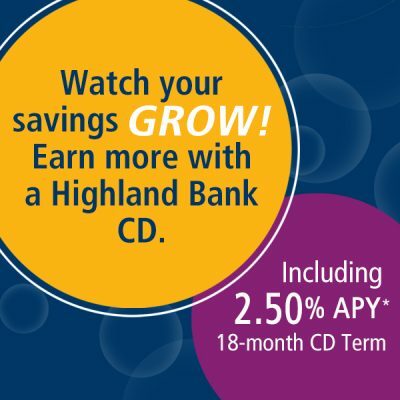 Maximize your interest earnings and take advantage of our 2.5% APY* 18-Month CD Term. *Annual Percentage Yield (APY) is accurate as of April 1, 2019. $5,000 minimum balance needed to obtain APY. Maximum deposit of $250,000. Penalty for early withdrawal. Automatically renewable at closest regular term and APY. Interest paid annually and at maturity. The Annual Percentage Yield (APY) assumes interest remains on deposit until maturity. A withdrawal will reduce earnings. Interest begins to accrue on the business day you deposit any non-cash item (for example, checks). We use the daily balance method to calculate the interest on your account. This method applies a daily periodic rate to the available principal in the account each day. Fees may reduce earnings. The Annual Percentage Yield (APY) assumes interest remains on deposit until maturity. A withdrawal will reduce earnings. Interest begins to accrue on the business day you deposit any non-cash item (for example, checks). We use the daily balance method to calculate the interest on your account. This method applies a daily periodic rate to the available principal in the account each day. Fees may reduce earnings.